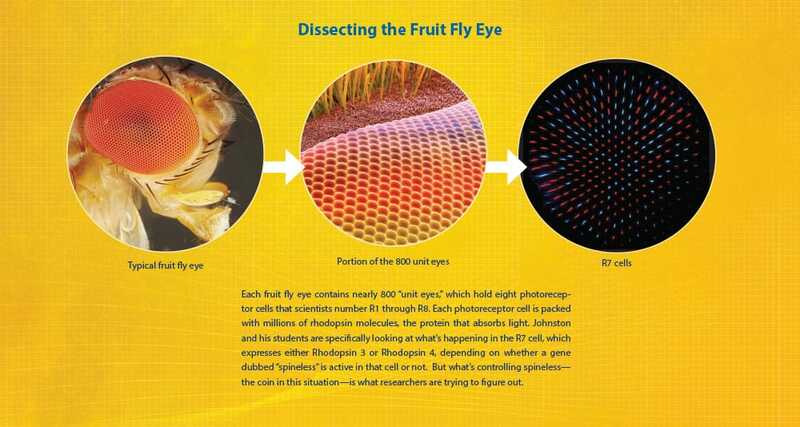 Using the retinas of fruit flies, biologist Robert Johnston and his team are examining randomness on a microscopic level to better understand gene regulation—research that could ultimately hold solutions for a wide variety of devastating diseases. Consider the coin flip, seemingly the epitome of randomness. We start our football games with it. Settle bets with it. Some people even rely on heads or tails to make major life decisions. But is the coin flip really as random as we think? When Robert Johnston was a postdoc at New York University, he heard a talk by Persi Diaconis, a former professional magician and now a professor of statistics and mathematics at Stanford University. Diaconis had become renowned for proving that the outcome of a coin flip can be predicted by a little high school physics: If you can standardize the force with which you flip a coin off your thumb, recognize how it will flip in the air, and know when to stop its motion, then you can accurately call heads or tails every time. Johnston is looking at randomness on a microscopic level: Why a gene is randomly on or off in otherwise identical cells. These random choices are important for the development of immune cells, stem cells, and neurons. Mutations in these cells cause a variety of illnesses in humans, from vision disorders to immunodeficiency diseases to various types of cancer. Instead, approximately two-thirds of the cells develop into one type and the remaining third becomes the other type. But which type is chosen is a completely random decision. Perhaps a better example is dice, says Johnston. Imagine rolling 1 to 4 gives you one type, and a 5 or 6, gives you another type. But what causes nature to roll a 3 or a 6? Is there something that influences the outcome? 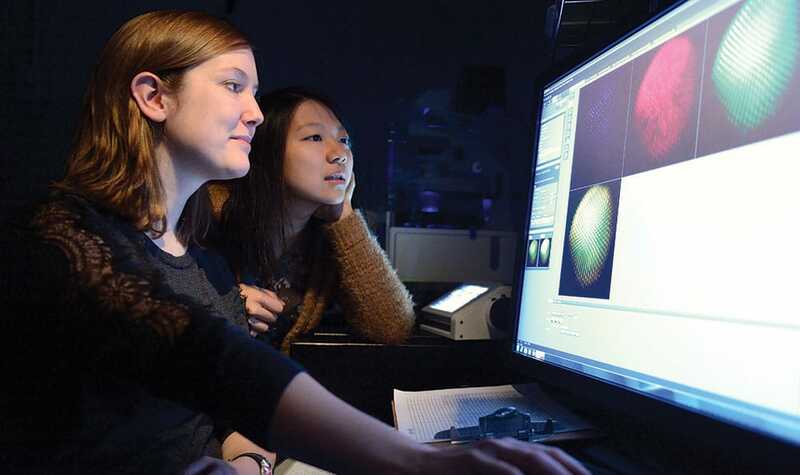 Graduate student Caity Anderson (l) and research assistant Jenny Yan examine images of the R7 cells. Just how small are we talking? Imagine the head of a fruit fly as being about the size of a grain of sand. Now imagine zeroing in on its eye, which is a fraction smaller. Now think about trying to detach its retina. Yes, that small. Anderson started working in Johnston’s lab last summer and says it took her awhile to become proficient enough to remove a retina from a fly. “Anyone can dissect their first one, but to get a pretty retina that’s intact, it took me about a solid month or two of working every day.” Now she says she can pop one off in less than two minutes. Anderson sits in front of a microscope in one of four rooms that constitute the Johnston Lab in Mudd Hall. Two rows of three scopes each accommodate graduate and undergraduate students who dissect flies and cross genotypes, creating new genetic strains. Students gather specimens from an anteroom with three refrigerator-sized incubators holding rows upon rows of glass vials containing flies and larvae. “Would you like to see me dissect a retina?” Anderson asks. A little fly eye anatomy first: Each eye contains nearly 800 “unit eyes,” which hold eight photoreceptor cells that scientists number R1 through R8. Each photoreceptor cell, in turn, consists of the cell body and the rhabdomere, which is made up of toothbrush-like stacks of membrane called microvilli. These are packed with millions of rhodopsin molecules, the visual protein that absorbs light. This is where the rubber hits the road. Johnston and his students are specifically looking at what’s happening in the R7 cell, which expresses either Rhodopsin 3 or Rhodopsin 4, depending on whether a gene dubbed “spineless” is active in that cell. But what’s controlling spineless—the coin in this situation—is what researchers are trying to figure out. Microscopic images of fly retina courtesy of Johnston Lab. She places the retina in a small glass well, filled with formaldehyde, which will later be stained with antibodies causing the rhodopsin proteins to “light up” like bursts of fireworks under a more powerful microscope. And then the counting begins. On a computer image of the stained retina, Anderson will count each rhodopsin, looking for variations in the expected two-thirds, one-third ratio. In a normal retina that ratio should be fairly consistent, but by altering the genome of the flies, she can see if those changes in DNA caused the ratio to be off, giving her clues as to how spineless operates. If they find a gene that disrupts the ratio, they can look at the mutation in a different experimental context, to see if it’s influencing spineless. So far, the team has identified a gene called klumpfuss that appears to alter the ratio in the case of fruit flies gathered from the wild. For years, Johnston had wanted to explore the same kinds of mysteries in human retinas that he was investigating in the fly eye. He was familiar with the work of Yoshiki Sasai, a scientist in Japan, who was growing human retinas from stem cells, but the technology was new and unavailable at NYU. In the spring of 2014, Johnston gave a talk at Johns Hopkins’ Wilmer Eye Institute he called “From Flies to Humans: Stochastic Expression of Color Detecting Opsin Proteins.” “I warned them that this was going to be 99 percent about flies and 1 percent about humans,” he says. So last summer, another of Johnston’s graduate students, Kiara Eldred, began growing stem cells into human retinas. After an initially successful “crop,” Eldred established her own facility in Mudd Hall in February. Within two weeks, she already had a fresh batch of retinas incubating. Graduate student Kiara Eldred and the human retinas she is growing in the Johnston Lab. “It’s pretty exciting stuff and I really like how it’s directly relatable to humans…” says Eldred, who says she knows of only four other labs in the world with the capability to do what she’s doing at Mudd Hall. Human retinas differ from those in flies in that our photoreceptors detect three colors, not two. If you’ve ever seen a movie in which someone undergoes a retina scan to gain access to a bank vault or the villain’s lair, that’s what the machine was scanning—the unique pattern of red, blue, and green receptors or cones in the eye. But as in the case of the fly eye, researchers are also baffled as to what mechanism determines that mix of color sensors in humans. After the retinas mature in 150 to 170 days, she’ll stain and image them just like the fly eyes. “We’re going to look for transcription factors that might be specifically expressed in one group or another and hopefully get some insight as to what’s controlling the stochastic process,” she says. Johnston is equally excited that the human retina experiments are underway. He says his “dream experiment” would involve visualizing the development of retinal cells in real time via time-lapse imaging over several months. It’s never been done before, but examining a time-lapse progression could give researchers a front-row seat as to how photoreceptors “choose” to become red, blue, or green cells. It would be like watching the football game from the start. 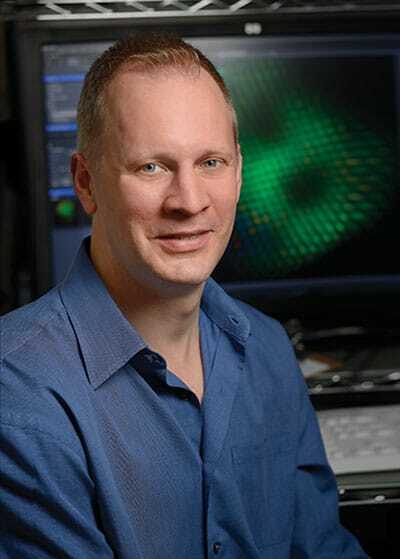 Johnston admits that he’s many years from making the jump from fly and human retinas to understanding what causes disease, but he hopes that someday, he’ll be able to predict the seemingly random coin flips of cellular biology just as Persi Diaconis does with a quarter.